Are you ready for the next Quilt-Along? 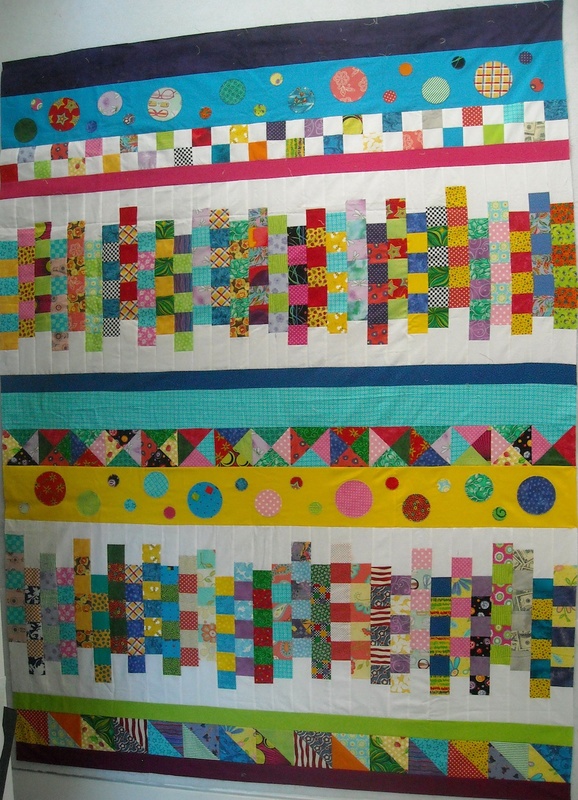 Just a fun, happy, easy, scrappy quilt that would be fantastic for a cheery drag-around quilt! The finished quilt measures 60″ x 80″. I don’t have mine quilted yet, but I’ll do better pictures when I get it completely finished. I gave the yardage information before, but I’m posting it here again, just for good measure. These are generous amounts, but this is just so you can do as much mixing and matching as you want, and still have room to change your mind or recover from a mis-cut (but you don’t ever mis-cut, do you? ), or use the leftovers in the piecing. An assortment of bright prints and bright solids to equal 5 yards. The more variety, the better. One thing I didn’t mention earlier, is that you’ll also need 5/8 yard for binding, but you could also make your binding out of scraps, which is what I may do my ownself — I haven’t decided just yet. You will also need 3 3/4 yards of backing fabric, if you’re going to piece your backing from yardage. Or you can use wide backing, in which case you’ll only need 1 7/8 yards of 90″-wide backing fabric. And you’ll, of course, need a batting of your choice in the appropriate size. With all that, I think we’re ready to start, right? This quilt is done in the style of a row quilt, since it’s just rows of different elements all joined together. Some of them are repeated, so you’ll have to make 2 rows. Such is the case with this week’s row. We’ll get the more tedious parts out of the way first, so we’re starting with the applique circle sections. There’s one toward the top, and one further down in the quilt. For this, I used the turquoise and yellow background fabrics, but you can use whatever color you want for your backgrounds. Cut enough 6 1/2″-wide strips to piece a 60-1/2″-long background piece from. Just piece them end-to-end and then cut your length from them. One from turquoise, and one from yellow — or whatever background colors you choose to use. 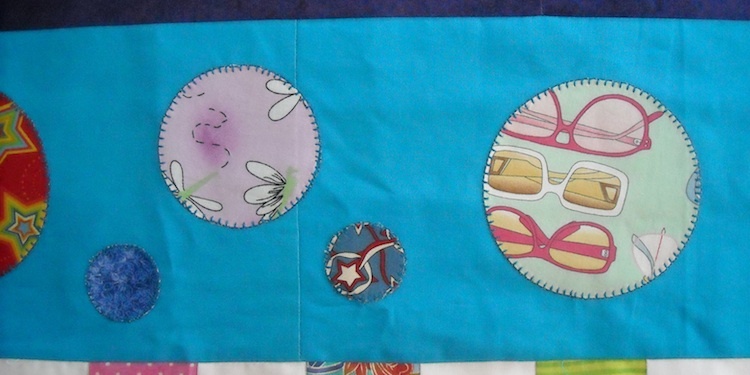 Next, you’ll need some scrappy circles to applique onto these background pieces. I just traced around some random-sized objects, cut out my circles, and started laying them out until I was pleased with my arrangement. You can make any size circles you want, and as many of them as you want. Just play around with them until you get the look you want for your quilt. You can even make some squares, or triangles, or use cookie cutters for lots of different shapes! Then use whatever method of applique you prefer to attach them to the background fabric. I fused my circles on, and then used my machine to blanket-stitch around the edges. If you want to fuse yours on, and need some help with that method, see my article on that HERE. You’ll need to make two of these strips. I’ll be back next Monday with the instructions for the next portion that we’ll be doing.